WB No. 249: SERENA is meant to keep the good aspects of the 30′2″ Shields-class one design, but in a boat that’s 25′ long. The new boat’s rig makes good use of the “flipping topsail” arrangement developed by Maine schoonerman Havilah Hawkins. Although inspired by a larger, longer-ended sloop, SERENA has relatively short overhangs in order to maximize her waterline length. The shallow keel carries 2,200 lbs of lead ballast. A 5-hp motor will drive the boat at a little over 6 knots in calm conditions. The boat’s large and spacious cockpit has plenty of room for guests and for lounging, and there’s even more seating forward of the mast. Do you have a boat concept you’d like to see Laurie McGowan and Michael Schacht develop on these pages? 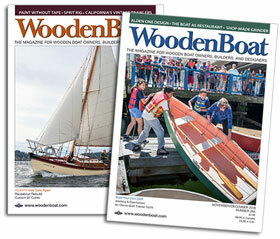 If so, send it to Sketchbook, WoodenBoat Publications, P.O. 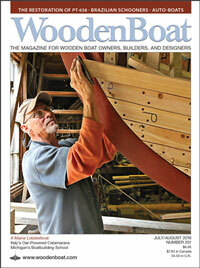 Box 78, Brooklin, ME 04616, or email it to sketchbook@woodenboat.com. Your letter should be no longer than 500 words.